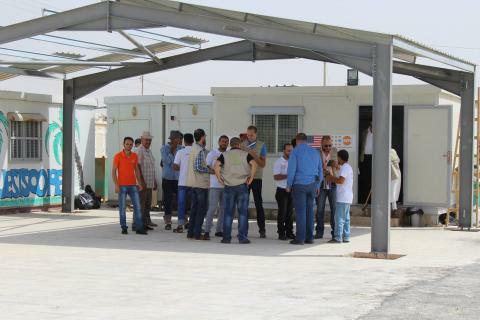 The Youth Center, the first of its kind in Za’atari Camp, provides a safe, welcoming space for young people to establish meaningful relationships and conduct activities that relies on their leadership to promote their positive development, wellbeing, and empowerment. By shaping and contributing to the very programs from which they benefit, youth participate in their community as agents of change. To encourage youths' engagement and participation, a Community Outreach Committee consisting of youth themselves, our Syrian volunteers, and Questscope staff meets regularly to discuss their issues. Finally, a unique Creativity Fund supports initiatives envisioned and designed entirely by these youth. The launch ceremony was opened by the International Director of Questscope, Dr. Curt Rhodes, and the UNFPA Regional Humanitarian Coordinator/Head of Jordan Country Office, Daniel Baker. 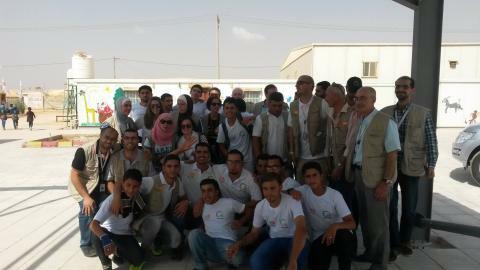 Special guests included Za’atari Camp Manager, Hovig Etyemizi; representatives from MBC, the European Commission, USAID, US Bureau of Population, Refugees and Migration; and representatives from the Embassies of Kuwait, Italy, Canada, and Sweden. Mr. Baker extended his gratitude to the donors who made the Youth Center possible, and Questscope volunteers performed a short play about the importance of adult mentoring for youth. As Dr. Rhodes described in a heartwarming speech, for us to truly understand one another, we must walk alongside these youth, sharing their experiences and their lives. These are the kinds of relationships cultivated at the Questscope Youth Center, generating in youth and volunteers renewed hope, passion, and joy.